If you’re someone who craves citrus all year long and likes the winter interest of glossy foliage, attractive fruit and fragrant flowers, then the Meyer lemon is the tree you should plant! It is the most dependable citrus here in Sonoma County, bears fruit most of the year, is beautiful to look at, and can be grown successfully in containers. It has even been successfully grown inside as a houseplant! Brought originally from China about 100 yrs ago, the Meyer lemon is thought to be a cross between a lemon and some type of orange or tangerine. The fruit is a rich orange-yellow in color and is thinner-skinned and sweeter tasting than the more acidic lemon varieties such as Eureka or Lisbon which are the most common lemons found in grocery stores. It is a self-pollinated, compact plant which produces fruit throughout the year, and grows to about 10 feet tall. The Meyer lemon’s reliability in the County is due to its ability to withstand colder weather than most citrus. However, in severe cold below 20 degrees F, it needs to be covered or have a heat source nearby. About 10 years ago, there was a heavy freeze for several nights when I was away and I was not able to cover my tree. It froze completely and a few months later I cut it back severely. (You should wait until new growth in spring appears to prune frost-damaged trees so that you can distinguish the extent of the damage.) Despite its woeful appearance, the tree grew back and now, 15 years after planting, this tree is 5 ft tall, 6 ft wide, and continues to produce lemons all year long. An alternative to covering your tree is to string holiday lights through the branches, which usually provide enough heat to do the trick and you get decoration, too. 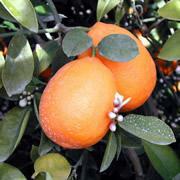 Lemon trees need to be planted in sandy loam and they like their soil moist but not soggy, so drip irrigation is ideal. Schedule such that they can dry out between waterings. The main requirement for fertilizer is nitrogen, which can be supplied through good compost. These trees will also benefit from mulch, which helps to conserve water and improve the physical properties of the soil. Assistance with diseases and disorders of citrus can be found at the UC Integrated Pest Management site. The Meyer lemon is valued as an ornamental and makes an excellent hedge because it needs little or no pruning. Dwarf Meyer lemons also grows well in containers and is a favorite on the patio with its bright orange-yellow fruits, its dark green leaves and intensely fragrant flowers. If planted in containers, fertilize 2-3 times per year, starting in spring. Start them in tight pots, as they like to be contained. In the kitchen, the sweet, juicy Meyer lemon is everyone’s favorite. The variety of things that can be done with it are endless: Think of lemonade, lemon vinaigrette salad dressing, squeezed lemon over asparagus, sliced lemon on fish, hot lemon water with honey for those sore throats, and desserts such as lemon curd or lemon meringue pie! Remember that due to its mixed parentage, the Meyer lemon is not as acidic as the more common Lisbon or Eureka, so plan your recipes accordingly. Meyer lemons are available all over the County right now, from high-end specialty nurseries to the hardware and big-box stores with garden centers. Since the 1970s the only variety available has been the ‘Improved Meyer Lemon’, so-called because it is resistant to a virus that had been problematic in the past. Try a Meyer lemon and bring some color and interest to your winter landscape!